Sonic Forces is now available and we have some gameplay footage of the game on PS4 Pro, Xbox One X and Nintendo Switch. The latter is limited to 30 fps and 720p (docked and handheld mode alike), but despite some visibility problems at times, it's a pleasant version to play in bed or during in the subway/bus. As for Xbox One X, it only switched from 1800p to 1080p, in which case it even looks worse than on Pro, which also runs in 1080p. Yuck yuck yuck. 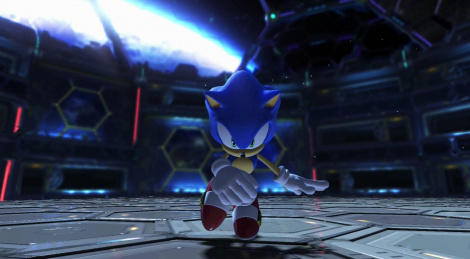 "Classic" Sonic, just like in Generations, still looks too small for the levels. Even though the 2D levels are supposed to be for him, they are still designed for the lankier, modern Sonic first. So what we get is a Honey I Shrunk the Hedgehog situation where he looks too small for everything in the level like the enemies he should be bigger than and even the spring jumps too. Even tunnels he goes through that force him into a roll, he should be able to just run through them because they are still too tall for him. And why do they use that damn Master System/Gameboy Advance game jump sound effect too and not the iconic Mega Drive one? It drove me nuts in Generations too and that had a Mega Drive era focus. Sonic and its fans are vile scum. Care to elaborate on what you are talking about there? Exactly. I had no idea where you came from with the "Ratchet" comment and then realised it was my avatar that triggered you. Oh well, here it goes then. A GOOD Sonic the Hedgehog game might come close to a main series Ratchet and Clank game that is almost always 8/10 to 10/10 stuff. But a good Sonic game is very hard to find these days with a Mega Drive looking game being the best thing that has happened the franchise in 2 decades and I love it. An awful Sonic game, which is just about everything the past 22 years apart from Colours and..................... that's about it (lol you thought I was going to include Honey I Shrunk the Hedgehog Generations in there), is an awful game and that's that. An Insomniac Games game just does not fit into what you are talking about. http://www.metacritic.com/game/playstation-4/ratch... 85 on a high 101 reviews. And both were 40 quid at launch in case you forgot so Sonic Forces doesn't get to use that as an excuse. Still better than Ratchet? Nope.